This is a fun instrument, no sharp notes and when I bought mine there was no model with sharp notes available. The sound is short but forceful, almost rhythmic and works very well for reinforcing hook and riffs both for acoustic and electric instrument. It has none of the bell like ring of the metallophone and while they may look like very similar instruments the sounds they produce inspires very different kinds of music. This instrument has more of a dark feel to it whereas the metallophone is bright and airy this is dark and damp. This is an instrument well suited for making interesting rhythmic backgrounds especially when used in combination with electric guitar. 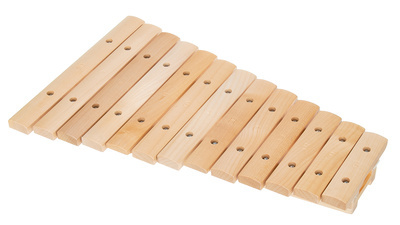 It is well tuned (usualy xylophones for chidren are not tuned really good), and has pleasant, warm sound. Great toy for children, it is not annoying at all because of its warm and beautiful sound. ID: 137827 © 1996–2019 Thomann GmbH Thomann loves you, because you rock!